I'm participating in the 4! Ounce! Challenge! on Ravelry. This is a spin/design/create-along, in which spinners make a yarn, design a project, and then release the pattern on Ravelry. 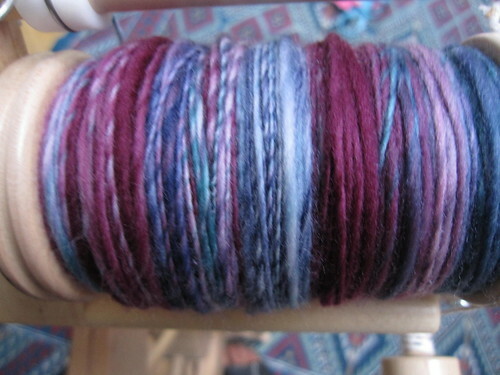 The motivation behind this event was every spinner's common problem: I saw some really pretty handdyed top, and bought 4 ounces, and spun this yarn - now what do I do with it? The idea is to end up with a bunch of patterns that are suitable for four ounces of handspun. The Challenge occurs over the months of August and September, and prizes will be awarded to a few of the lucky folks who design and release patterns. My personal Challenge within the Challenge is this: spinning up 8 ounces in August while being on vacation away from my wheel for three out of four weeks. This translate to: spin, ply and finish 8 ounces of fiber in five days. Packing wet yarn at the final moment on Friday is not allowed. I've started with some superwash merino top from Spunky Eclectic, colorway "Thunderstorm". This one is getting spun long draw from the top, slightly thicker singles then my usual, and will be chain plied. So far (one viewing of Aladdin) I've gotten through a bit more then half of the braid. I'm hoping to finish up the singles tonight, and then I'll let them rest for a day while I spin the other bump. 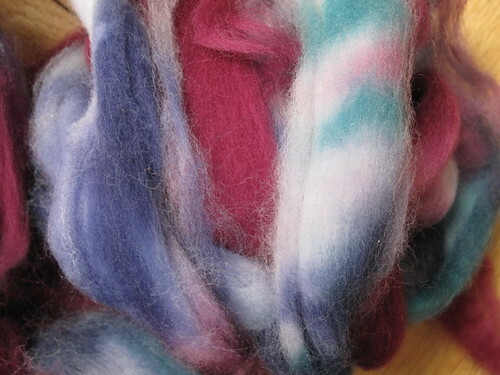 If nothing else, I think the Tour de Fleece made me a faster spinner. Thankfully! Written by porpoise On August 8, 2010 In "4OzChallenge", "spinning"